Our latest adventure included a weekend camp at Pickett State Park just north of Jamestown, TN. From Knoxville we headed north up I-75 and took the Oneida exit. This way took us through the scenic Big South Fork area. I’ve always loved this area since camping with the grandparents at a young age. I didn’t realize how close Pickett was to the Charit Creek Lodge until passing the signs just before the Pickett entrance. The Pickett State Park area is really nice and had lots of hiking trails, caves, and a neat suspended bridge over the water area. Our trail ride through the forest led us by some scenic views and other natural formations that could only be accessed via off road vehicle. I’ve included some pictures from the trail ride below. It was a great time with family and friends. Since the sale of the 1982 CJ7, we have improved it more and it is now a better looking and more capable vehicle than ever before. Our pal Brandon has really cleaned this rig up since the purchase in November 2009. The latest upgrade to the Jeep was the addition of the Genright aluminum fuel tank, 4″ stretched rockers and 3/16″ steel corners. Luckily there was some left over paint for the body shop to finish the project for us. The Jeep drives better than ever. And, Brandon won’t be so concerned since this extra climbing stability will keep him a little more comfortable. 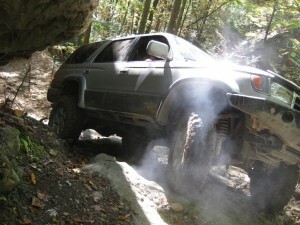 This local Knoxville couple had worn the stock tires to nothing. ” We wanted more than just the replacement highway tire, something to make the vehicle look like it’s really 4 wheel drive.” Off with the old and UP with the new. The decision was make to up the ante with some 33/11r18 Nitto Terra Grapplers. To make room for the new size, the QX56 was lifted 2″ via steel and aluminum coil spacers. Since the rear was supported with an air bag assist shock, we had to trick the suspension into thinking that it was under a load. Once leveled out, we took the truck to the guys at Pete’s Alignment for them to do their thing. 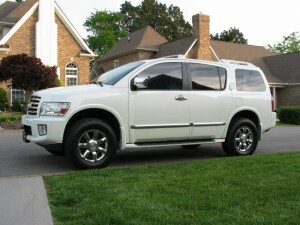 The result is a clean, smooth riding SUV with the capability to tame more than just the local mall parking lot. 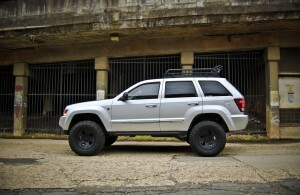 The 2005-up Grand Cherokee WK isn’t thought of as an off roader, until now. Check out Jay’s WK outfitted here at our shop with Superlift’s 4″ suspension, AEV Savegre wheels, and Goodyear Duratrac tires. 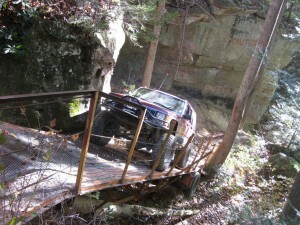 The foundation for this build is a 2005 Grand Cherokee with the 5.7L Hemi engine. 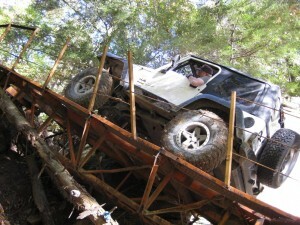 The power that the engine provides allows the Jeep to turn the 285/70r17 tires without issue. To correct the speedometer and ESP/Traction control we’ve added the AEV EGR Module. This electronic device sends the recalibrated info to the instrument panel and various modules to allow the Jeep to perform as if it were straight from the showroom floor. 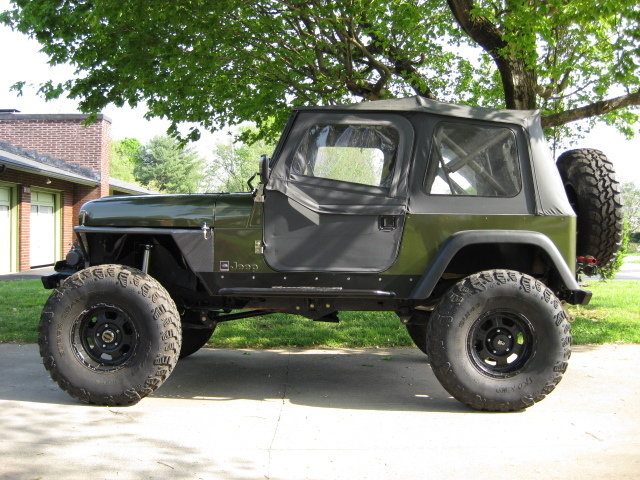 A great combination of parts professionally installed makes this one slick off road wagon!